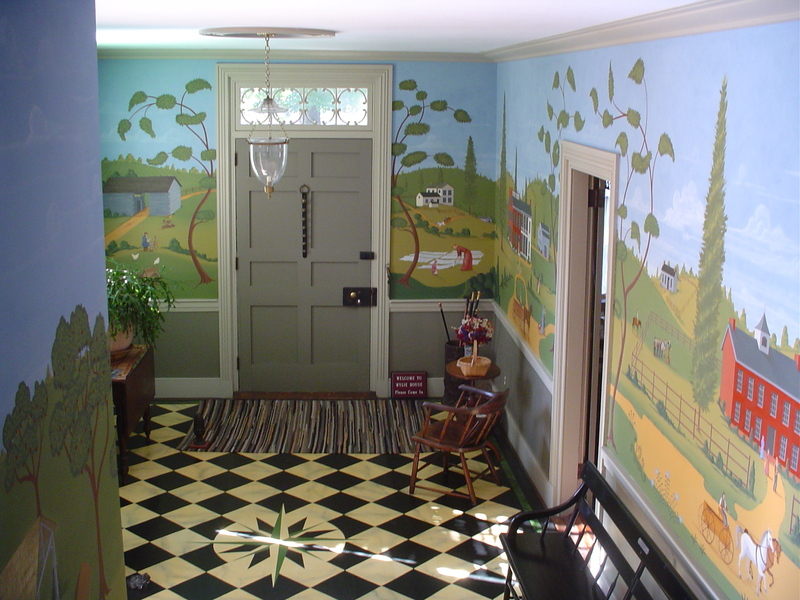 The first thing that many visitors spot when they enter the Wylie House is the large mural painted in the front entryway. It’s impossible to ignore the colorful rolling hills and old style buildings that cover every wall of the entryway. Although wall paintings were common in the homes of wealthy merchants and landowners of the 1800s, the one here isn’t quite so old. The Wylie House mural was painted in 2009 by John Thom, owner of Florentine Finishes in Bloomington, and his assistant Isiah Killion. 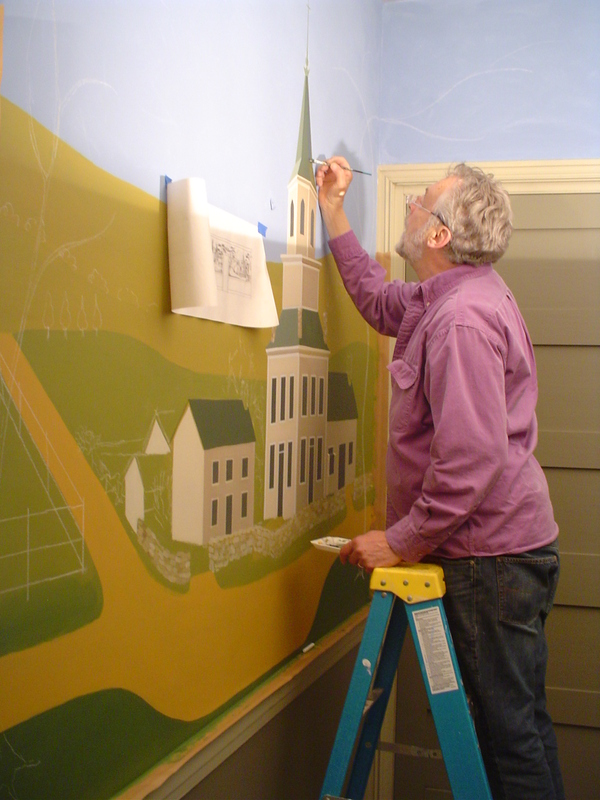 The mural was painted in the style of Rufus Porter, a 19th century American painter known for his murals of New England landscapes. Porter, who also invented the revolving rifle and founded Scientific American magazine, painted simple country scenes on the walls of farmhouses across the northeastern United States. He usually painted on dry plaster walls with a mixture of pigment, water, and glue, which is part of the reason that his work has been so well preserved for almost 200 years. The Wylie House mural, like the ones painted by Rufus Porter, depicts a landscape; instead of New England, however, the painting portrays scenes of 19th century Bloomington and the early IU campus. It includes the first Bloomington courthouse and the well and outbuildings from the Wylie property when it was a twenty acre farm. The structures in the mural are based on historical documents and photographs, giving visitors a glimpse into what they might have looked like in the 1800s. Among the historic buildings, the mural also depicts common activities like horseback riding, bleaching laundry, and apple gathering. 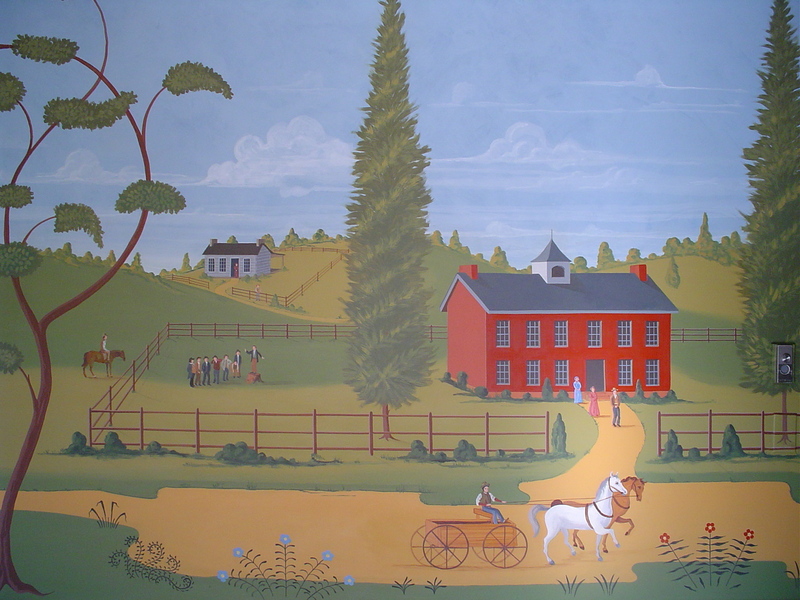 This mural may not be original to the Wylie House, but it depicts an important time in Bloomington’s history and offers a glimpse into the possible surroundings of the house when it was constructed in 1835. Next time you stop by the Wylie House Museum for a tour, be sure to take a closer look at the mural and take a step back in time.